Members of the cycling community gathered Wednesday night after a woman was struck and killed by a garbage truck. NBC10s Aaron Baskerville reports. Advocates hope by forming a human barrier, they could impact the city to make actual physical barricades between drivers and cyclists. Emily Fredricks, 24, died Tuesday when a trash truck struck her bicycle at 11th and Spruce streets in Center City. The bike lane along Spruce Street is faded and there is no physical barricade separating cars and bikes. 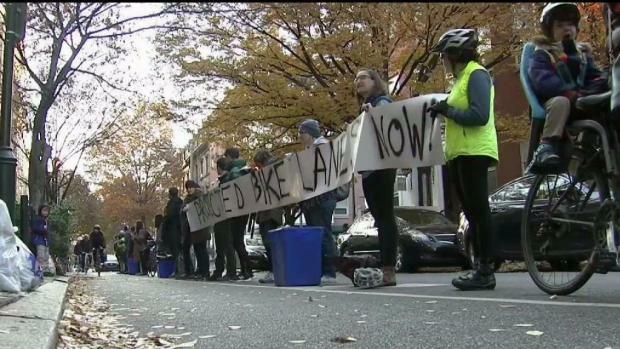 About 24 hours after a sanitation truck struck and killed a cyclist while making a turn in Center City Tuesday morning, people stood arm in arm to call for heightened bicycle safety on Philadelphia streets shared by bikers and drivers. The "human bike lane" action Wednesday morning featured cyclists, pedestrians and motorists standing along two blocks of the Spruce Street bike lane, separating cyclists from passing traffic. Some of the dozens of advocates held a sign that read "Protected Bike Lanes Now." "We are here demonstrating that we would like more safety in our streets for our cyclists and pedestrians," said Leigh Goldenberg, who helped organize the action. Flowers and candles mark the intersection at 11th and Spruce streets where a privately-owned trash truck struck and killed 24-year-old Emily Fredricks as she biked to work as a pastry chef around 7:25 a.m. Tuesday. Spruce Street, a one way street westbound, has a dedicated bicycle lane on the right hand side. There are no barricades separating that lane from car traffic and much of the paint showing the divide has faded since being installed more than seven years ago. "There is a buffer, which is in this case is usually indicated by paint, between where the cyclists would be and where the cars are driving," Goldenberg said. "If we had protection it would be where theses bodies are standing. So we are physically putting our bodies in the space where we are asking the city to build safer infrastructure." From repainted lanes to concrete barriers, bikers in the city are asking officials for new sets of rules to keep people safe. This comes after a trash truck struck and killed a 24-year-old woman while she was biking along Spruce Street in Center City on Tuesday morning. The city said Spruce is scheduled to be re-striped next month. Fredricks' death — the third this year, according to the Bicycle Coalition of Philadelphia — put a spotlight on cycling safety in Center City where cars, trucks, buses and bikes share the road daily. 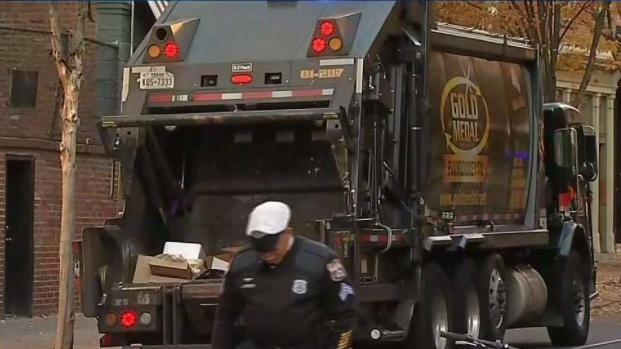 A trash truck struck and killed a 24-year-old woman while she was biking through Center City near 11th and Spruce Tuesday morning. NBC10's Tim Furlong has more on what he is learning from police. Bicycle advocates are fighting to get better safety infrastructure on Philadelphia streets. Some streets, like Chestnut Street in West Philadelphia, now have posts that divide drivers from cyclists as part of the city's Vision Zero plan to create better bike lanes, including possibly raised bike lanes. 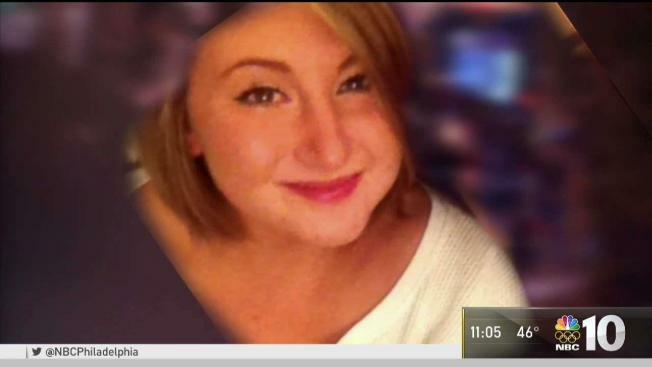 Advocates want action as soon as possible to prevent further tragedy. The current bike lanes, like the one along Spruce, are sometimes used by motorists loading or unloading, forcing bikers back into the flow of vehicular traffic. The Bicycle Coalition of Greater Philadelphia organized a 5 p.m. Wednesday vigil at the site of the deadly crash in the memory of Fredricks and everyone else killed in traffic crashes in the city. A large number of people held candles and listened to speakers before dozens of bikers took part in a ceremonial bike ride. "This means so much there is a whole community here that cares," Katlin Sullivan, Fredricks' best friend and roommate, said. Emily Fredricks died when a trash truck struck her bike along Spruce Street in Center City on Nov. 28, 2017. Wednesday's events were organized through social media. "Just being one (death) is significant enough to, at least, look at what happened and maybe see what can be done to make sure things like this don't happen again," Philadelphia Police Capt. Sekou Kinebrew said at a Tuesday news conference. The deadly collision remained under investigation Wednesday and no charges have been filed.